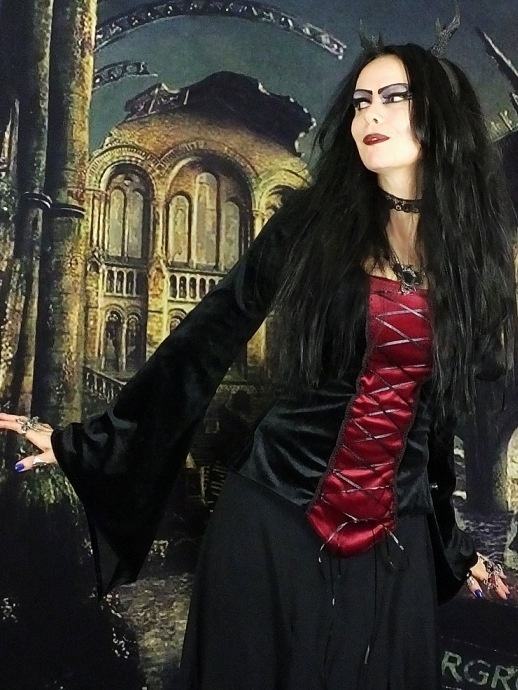 Here's a beautifully simple but stunning top, perfect for all manner of goths and fae creatures... the Eledhwen Maiden Top!<br> <br> Based on our classic Eledhwen Top, this is an "on-shoulder" version, made from steamed velvet, with elegant medieval detailing on the front of the bodice; braided looping laced with narrow ribbon... pretty!! !<br> <br> It's shown here in Black and Claret steamed velvet, but can be made in any combination; and is also available in any compbination of our crushed velvet range! It's worn in the pics above with our Gofficeia Skirt, andMoonshadow Mausoleum Skirt! Here's a beautifully simple but stunning top, perfect for all manner of goths and fae creatures... the Eledhwen Maiden Top! Based on our classic Eledhwen Top, this is an "on-shoulder" version, made from steamed velvet, with elegant medieval detailing on the front of the bodice; braided looping laced with narrow ribbon... pretty!!! It's shown here in Black and Claret steamed velvet, but can be made in any combination; and is also available in any compbination of our crushed velvet range! It's worn in the pics above with our Gofficeia Skirt, andMoonshadow Mausoleum Skirt!